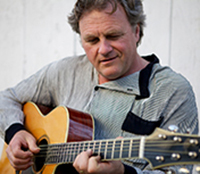 Singer-songwriter-guitarist-multi-instrumentalist Harvey Reid currently uses the following musical instruments and gear. He also uses some other instruments and equipment, but this is his current, primary list of tools, for those who are curious. Slide Guitar He is often usually seen playing (especially on tours that involve air travel) an unusual Chrysalis guitar for slide, which also has an inflatable body which he does not use on stage. He may be the only musician touring with one of these. Read Harvey's in-depth discussion of it. 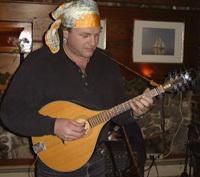 Resophonic Harvey in 2003 began playing a Richie Owens cutaway with a Zeta pickup system. They are no longer being made. It travels occasionally. Dobro for many years, from 1978 till 2003 Harvey performed with an early 1970's metal body model. 6-String Banjo 1988 Deering Maple Blossom MB-6 (wide-neck) is still the primary one performs with, though he sometimes uses a Boston open-back. It has a Fishman banjo pickup, and a customized Fishman Aura pre-amp. 6-String Nylon-String Banjo 2015 Deering Solana nylon-string banjo. This one does not travel much, but it is showing up now and then in performances and videos. 12-string Taylor Maple Jumbo Cutaway wide-neck (1988) This is the one he has used for all of his recordings, except for "Lost Lullaby" on Guitar Voyages. It has custom inlay by Bob Taylor, Wendy Larrivee and Larry Breedlove, and no longer travels. Mandocello He uses a custom 1998 Adamas, one of a handful ever made-- on stage you will see Harvey sometimes playing a Chrysalis mando-cello, one of only 2 in the world. 6-string (for recording and occasional concerts) Taylor wide-neck cutaway 810 rosewood dreadnaught (1984 and also a gray 1990 model) He used this guitar for both his guitar CD's, and much of his recorded output. R.L. Givens has passed away, and there are no more new instruments from him to be had. 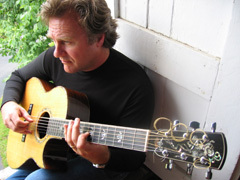 Harvey began using the new Fishman Aura system in December of 2003. It is a sophisicated new technology that essentially is a computer that modifies the soundwave produced by the instrument pickup in real-time and converts it into the soundwave that would be produced by a microphone. It stores an image custom-made for each of Harvey's instruments, and allows the much more natural sound of the microphone to be heard at volume levels that were previously impossible.It is also a pre-amp, tuner and direct box, and has replaced the Blender (combination mike/pickup system) that Harvey has used for over 12 years. He uses Hamilton KB-39 Hanger and Peak Music guitar stands and a BOSS TU-12 tuner. Currently he has a FISHMAN Matrix Natural in his 6-strings, a Bill Lawrence Red in his 12-string, a FISHMAN SBT guitar pickup in his autoharp (along with an Oscar Schmidt pickup) + Dobro, a FISHMAN mandolin pickup in his mandolin and bouzouki, and a FISHMAN banjo pickup in his 6-string banjo. He uses no other effects or EQ on anything else, except reverb. 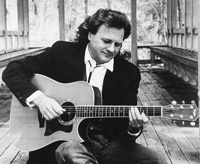 On guitar and mandolin he uses Jim Dunlop Tortex flatpicks, usually yellow, but sometimes orange or red (very rarely). He uses Jim Dunlop plastic thumbpicks and one Dunlop fingerpick, plus 2 of the no-longer-available Dobro plastic fingerpicks. Same fingerpicks for 6-string banjo. 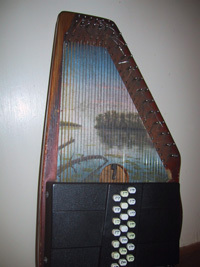 On Autoharp he uses a National plastic thumbpick, and 3 National or Artcom heavy-gauge metal fingerpicks. Harvey has done much of his direct-to-master recording in the 1990's with a Panasonic 3700 DAT and a 3800 DAT machine, though sometimes used a Sony DatMan or a Panasonic SV-355 DAT. Recordings from 1989 to 2000 used Audio-Technica 4051 mikes, though more recently he has used AT4047 large-diaphragm mikes. He has used some other gear that is listed in the liner notes for each album. CD's after #114 until the present were recorded in 24-bit with a Mark of the Unicorn 2408 system, Macintosh G4 computer, API Pre-Amps, and an Apogee 8000 converter. Mastered and dithered by Northeastern Digital of Southboro, MA, and since 2001 by Thomas Eaton Recording of Newburyport, MA. Complete information about recording of each album is given in Liner Notes to his many recordings.